Cynthia Schira has been exhibiting internationally for over 40 years. She is the recipient of two NEA grants, a Tiffany Grant and an Honorary Doctorate of Fine Arts from the Rhode Island School of Design. 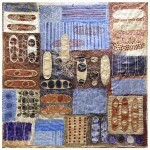 In 2000 she was awarded a Gold Medal from the College of Fellows of the American Craft Council. My continuing and underlying intent has been to integrate woven structure and image so they are physically and visually inseparable. Varying series have evolved over time within these general parameters. 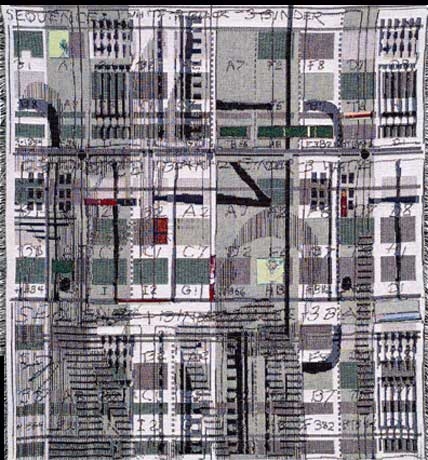 I have translated systems of marks – diagrams, ciphers, and computer gibberish into my weavings. Reminders continues within this realm but visually plays with my every day notes and doodles rather than known systems I concentrated on previously. It is a Jacquard weaving on a six color cotton tapestry warp with two color cotton wefts. I wove it in North Carolina at the Oriole Mill.